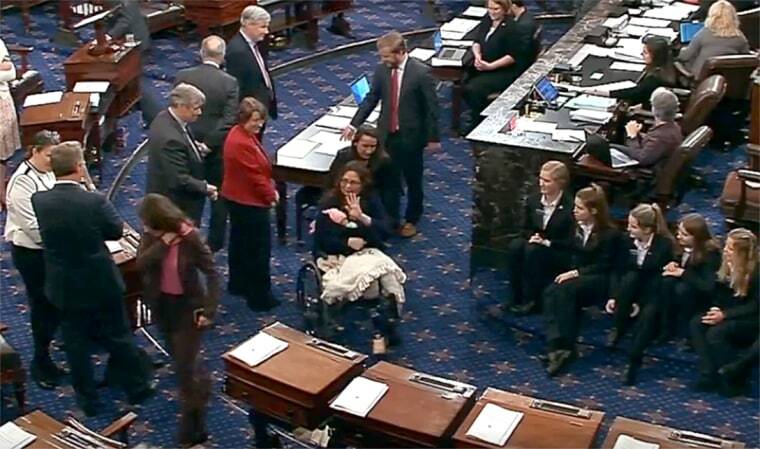 A rare change in the rules paved the way for the Illinois Senator to bring her newborn daughter onto the Senate floor. "It meant so much to be able to cast the vote as a mom and be able to do my job and take care of my baby at the same time," she told reporters after the vote. When it appeared hers could be the deciding vote on the nomination of Rep. Jim Bridenstine, R-Okla., to become NASA administrator, Duckworth took a brief break from her maternity leave and headed to the Capitol to cast her vote in opposition. Democrats opposed the nomination because of the nominee's views on climate change and LGBTQ people, and because he has little background in science. Adding to the drama Thursday, Vice President Mike Pence was present in case he was needed to break a tie. When it became evident he wasn’t, Pence left, but some senators remained to witness history, congratulate Duckworth on her new family member and, of course, to see the new baby. The Senate chamber became one of the most exclusive clubs in the 1800s, when senators complained about too many people who were allowed to come onto the floor. Senators then created a list that has been added to over the last century but still allows just a few people into the chamber. Those include the president and vice president, members of Congress, the mayor of Washington and senators’ staff members. And, now, newborn babies are part of that list. Alex Moe and Frank Thorp V contributed.